You are receiving this email from London-based arts and social justice charity PLATFORM. We take your privacy seriously and never intend to send unsolicited email. If you would like to unsubscribe please click here.Having trouble reading this email? View it in your browser. Here at Platform 2013 is off to a flying start. There was great news today from the Netherlands on a historic legal win by a Nigerian farmer over Shell’s pollution. Read more about it on our blog here. Mika Minio-Paluello attended an exclusive conference in Cairo and listened to oil executives complain that “people don’t understand how difficult life is for us as oil companies … All they see is the billions we make”. BP and Shell want to use the Egyptian revolution to boost their profits, with proposals to “completely deregulate the system, and open the markets.” Read Mika’s account of the scramble for Egypt’s oil. In the wake of the horrifying loss of life at BP’s gas plant in Algeria, we look at the company’s history in the region and ask if oil companies should be operating in sensitive, conflict regions. Read the blog here. Our collaboration with Live Art Development Agency and artist Nicole Garneau as part of DIY9 in Summer 2012, ‘Art-Oil-Numbers-Bodies-Love’, is profiled here as part of the review of the year’s DIY projects. By artists and for artists, we look forward to the coming year’s events – more on DIY10 to follow soon. 16-25 year olds have just three days left to register for a free five-day Shake! 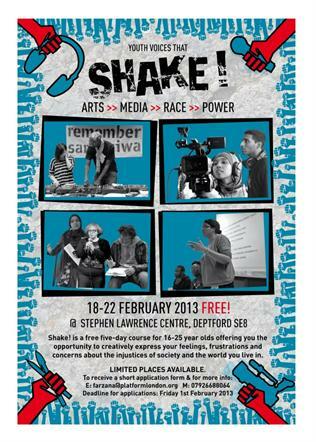 course at the Stephen Lawrence Charitable Trust: Arts>>Media>>Race>>Power. Shake! is a dynamic youth initiative using art as a powerful non-violent force for change and a celebration of youth voices. Each day Shake! creative workshops will provide space to imagine what justice looks like, experiment with new ideas, learn new tools, work with incredible artists and inspire your imagination! For more information and how to apply see http://voicesthatshake.blogspot.com/. If you know any 16-25 year old budding activists who would benefit from this opportunity, please do pass this on to them. The deadline for applications is this Friday 1st February. Our series of events around The Oil Road is also continuing apace. This Thursday we’re at the Firebox Cafe in Central London for a joint event to launch sociologist John Urry’s new book, Societies Beyond Oil. Join us for this free event to discuss what post-oil social futures might look like. Then on 5th Feb we’ll be in South London for a meeting with Transition Tooting, Transition Wandsworth, Wandsworth Friends of the Earth and the Wandsworth Environmental Forum. Please come along to one of these events if you’re in London. More events will be announced on the website soon, including visits to Liverpool, Bradford, Durham and the South West. Joint book launch for John Urry’s Societies Beyond Oil and The Oil Road at the Firebox Cafe, Bloomsbury, London. Free. Shake! arts >> media >> race >> power course. Stephen Lawrence Centre, Deptford, London. If you no longer wish to receive Platform events info by email please unsubscribe.